The HUM-Button is easy as 1-2-3! Wash your feeder and fill with nectar. Set on a windowsill or railing near an existing feeder. Stand near the feeder quietly and hold the HUM-Button in your hand. 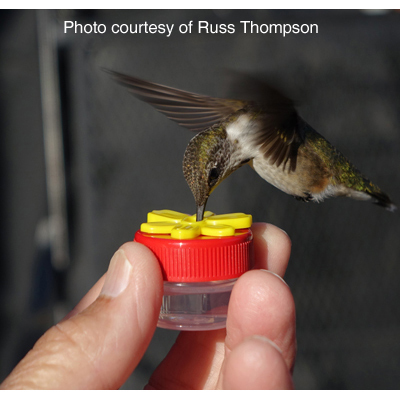 Hummingbirds will recognize the HUM-Button as a feeding source. Be Still...Voila! You're doing it! Hand feeding a hummingbird! Nectar Recipe: 1 cup plain white sugar mixed with 4 cups water, Boil and refrigerate for 1 week. Keep feeder clean every time you use it. Three buttons with 3 'business' cards beautiful showing hummer hand feeding. 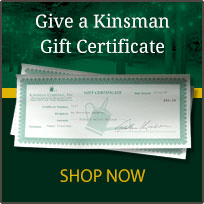 Fun, proud, give each one with card as gift. Of course kept one for myself. Tiny, hand held hummingbird feeders. Incredible! The hummingbirds were attracted to my red lips, but this is better. I made some red wrist bands to tempt them even more.